Monday: a new Z&F comic! A Clipart FAIL post! Lets make fun of the god-awful clipart, that people actually get paid for, on clipart.com. An old favorite here at zfcomics.com! NEW! Zorphbert’s Mission Log! Follow along with what Zorphie’s writing on that clipboard of his. Then, join the discussion– help shed some light on why we humans are so weird! Wednesday: a new Z&F comic! Fanart! Send in your sketches, guest comics, pin-up masterpieces! I’ll post them and link to your comic, profile, whatever you like! News, Updates, Comic Con Recaps, etc! I’m busy, as you know. NEW! “My Pet is An Alien!” Spotlight! Ever look at your dog, cat, or other pet and think, “What is WRONG with you, Spot? You gotta be from another planet!” Send me a picture of your pet, and a paragraph about WHY they are so weird, and I’ll FEATURE your pet in my blog! Just go to the contact page to send along your picture and description! Friday: a new Z&F comic! Every time I try out a new show, in a different region, I never really know what to expect. My friend Erica Schultz of M3 clued me not this one, and also offered me her couch. I figured, for a fair table price and not hotel costs, why not give it a shot. WOW. I have done a bunch of hotel comic cons before, but NEVER have I seen one maximized to this degree. They didn’t just rent out a single ballroom, they rented out EVERYTHING. Ballrooms, conference rooms, hallways, and aisles all were FILLED to the brim with dealers and artist tables. And, it was PACKED with attendees. From the minute the convention opened, until it closed, the hallways were packed, and the line of waiting attendees flooded out the hotel and into the parking lot. Many excited parents were there, even-more-excited kids in tow, and there was cosplay-a-plenty. I even witnessed a mammoth Hulk (on stilts! ), who was going around scaring children with his mammoth roar, get ROARED back at by a little girl! And then she politely asked if she could stomp on his foot. Still ticked at myself for not taking a video of this phenomenal moment. It was awesome to meet fellow creators Chris Gugliotti, Jason May, Chris Giarrusso, Emilio Velez, and Luke Foster, and see Dave Rodriguez again! Also, it was a great pleasure to meet close buds Scott “Jynksie” Jenkins of “Madbury” and Chris Watkins of “Odori Park”, and grab dinner with them and Erica after the convention! As far as I can tell, this was my best one-day convention yet, and I would definitely go back next year! If the hotel can hold it! 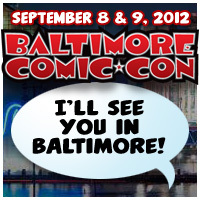 Psssssst… Baltimore Comic Con SOON! Baltimore Comic Con: My favorite convention of the year, folks! In just TWO WEEKS! If you’re a true-blue comics fanatic, and couldn’t care less for the movie/TV celebrities the bigger conventions (like Wizard World, San Diego) bring in, Baltimore is your convention. Marvel and DC exhibit there, and even Stan The-Man Lee will be in attendance on Saturday! I’ll be there amongst a bunch of talented friends– TL Collins of Bullfinch, Mike Witmer of Pinkerton, and fellow Webcomic Alliance member, Chris Flick of Capes and Babes!